The only thing that makes me happier at lunch than a good sandwich, is a good sandwich that comes with a surprise side of assorted pickled goodness. Giovane made me very happy. 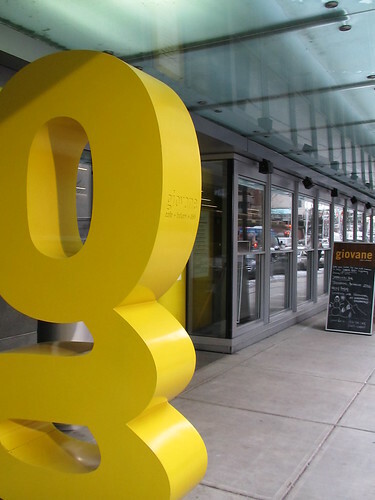 Giovane Cafe and Wine Bar is the restaurant associated with the Fairmont Pacific Rim Hotel. 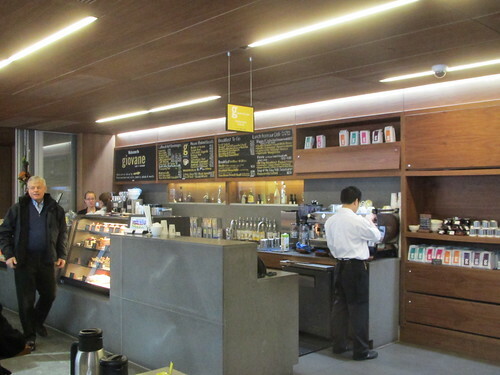 There are two sections to the cafe, pastries and coffee at one end and the deli and wine bar at the other end. Seating is abundant between the two sections with booth, table and bar seating. I haven't tried any of the pastries, but from all accounts that I hear, the sugar buns are fantastic. Alas, no sweets for me, I was there for a sandwich. The deli side of the cafe offers an assortment of lunch goodness with pre-made pizzas, paninis, salads and breakfast items (served until 11am). They also feature an Italian hot lunch special. 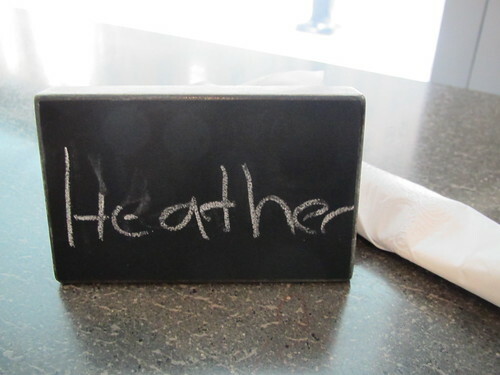 After you order your meal they give you this cute little name plate so they can find you. I like that they don't just yell your name. 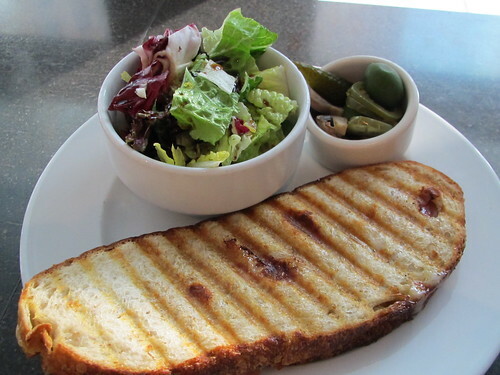 All of the paninis sound delicious and the menu says they are served with "house greens"
Food bonus! 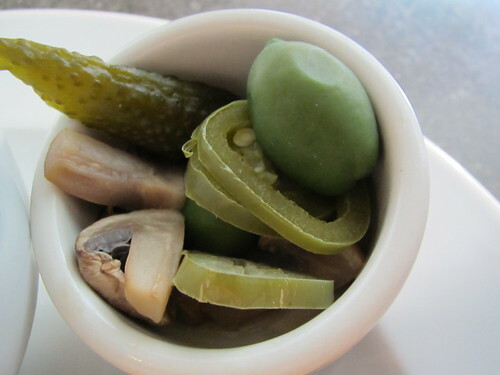 What they menu doesn't talk about is the awesome bowl of pickled items. I am always disappointed when you order a sandwich at lunch time and it doesn't come with any sort of side so I was really pleased that this sandwich came with a bonus side. I was so excited by the food bonus that I even ate the peppers knowing they would give me a hard time later. 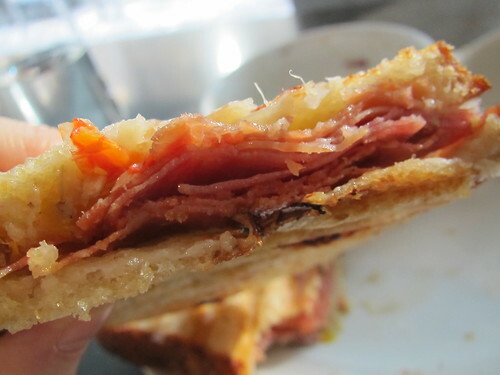 I really enjoyed the thin slicing of the bread for the panini, and how large it was. This could easily have been split into two meals, but I did not. I ate it all because it was delicious. It wasn't overly generous with the meat and cheese portions, but they use a really high quality of ingredients and I liked the combination of meats. 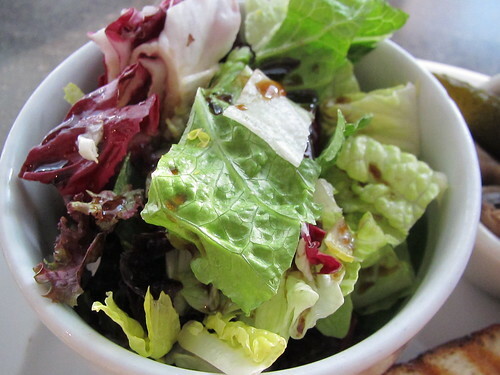 The side of greens were just that, lettuce with a balsamic vinaigrette but I appreciate that they did not call it salad. It is a bowl of greens. I was so happy with my lunch at Giovane. The staff were very friendly and helpful with the description of the food. The service was fast, which is good for a lunch crowd and the restaurant has a nice, warm vibe to it. I can't wait to try a pizza! In the evening they feature a wine bar with a cool wine on tap system as well.